An “Electromagnetic Radiation Specialist” said that his testing showed a hundredfold higher MPE level than the school district engineer’s report, but he modeled it on peak readings. When a fourth child was diagnosed with cancer at a San Joaquin County, Calif. elementary school earlier this year, parents championed the need to have a Sprint cell tower removed from the Weston Elementary school campus since it could be causing harm to students. The Ripon Unified School District (RUSD) sent out a letter to parents stating that the RF levels were way below federal levels after having it tested twice by Hammett & Edison, Inc. Consulting Engineers (H&E) to determine whether the tower complied with appropriate guidelines limiting human exposure to radio frequency electromagnetic fields. 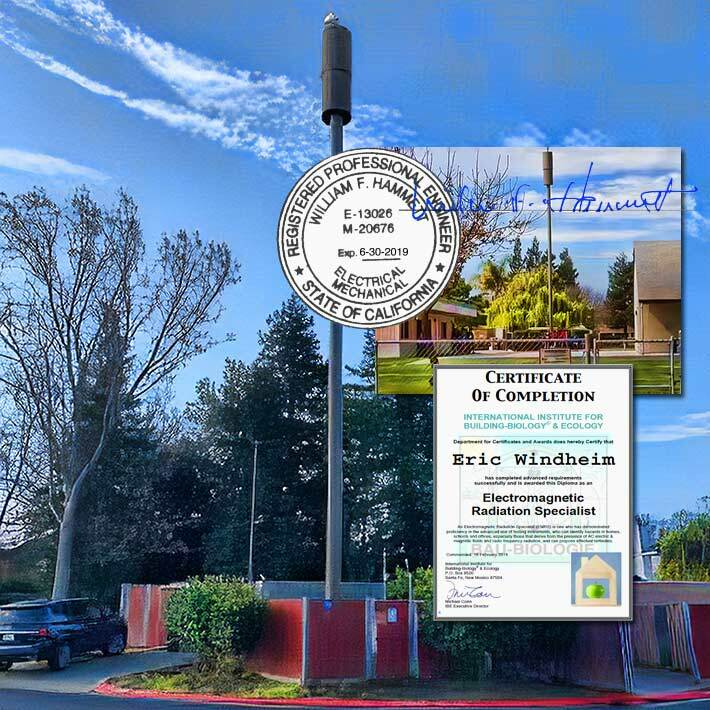 But a number of Ripon parents wanted assurances that H&E’s data was accurate and hired Windheim EMF Solutions of Sacramento, Calif. to verify their findings. After taking tests at the school, owner Eric Windheim informed CBS 13 on March 12 that his readings were “far higher” than H&E’s. Following his interview, Windheim informed Wireless Estimator that they were “a hundredfold” higher. His comments created a firestorm of concern. Newsweek picked up on the interview as did other media outlets throughout the country as well as wireless infrastructure reporters. The Ripon tower concerns also fueled parents in Germantown, Tenn. this week who are fighting the erection of a tower on the city’s elementary school grounds. 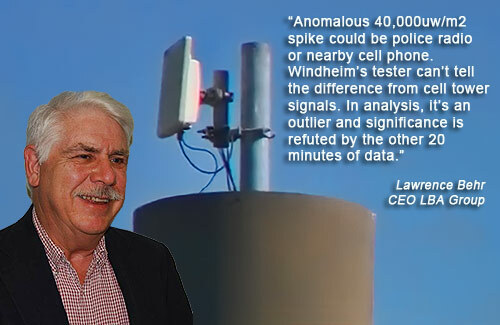 However, the genesis of one of their key concerns – Windheim’s test results -appear to be flawed and media outlets continue to run with it as gospel, said Lawrence Behr, CEO of LBA Group, a company that has been managing the application and safety of electromagnetic energy since 1963. Windheim said he used a Gigahertz Solutions HF59D meter, attenuator and antenna that was acquired in November 2018 and was within the required calibration period. Windheim said that a peak setting was used for all of his data logs and a peak hold for any spot readings that were 1-3 minutes in length. He said spot readings were taken at each location and the highest reading was written into the record. Behr strongly disagrees with Windheim’s methodology for testing and said that peak readings cannot be used and must be integrated over 30 minutes. “The HF59B manual is explicit that peak readings cannot be used to investigate regulatory compliance, but the chart provided by Windheim indicates peak readings. It also indicates peak readings over 20 minutes averaged 5712 uw/m2, not the 44,000 he reports. Further, the manual provides that a further 10 dB correction must be made from the peak value to average value to account for the LTE transmissions Sprint is using,” Behr said in his report to Wireless Estimator. “Windheim has confirmed H&E’s measurements,” Behr said. Behr also said that the HF59B test equipment was incapable of integration or weighting for MPE frequency factors per the FCC standard. 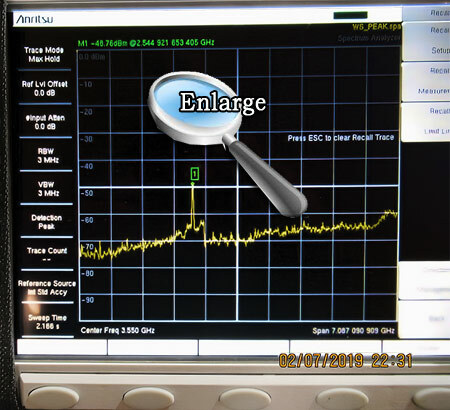 Windheim informed Wireless Estimator that he used an Anritsu RF Spectrum Analyzer 2721B using a telescopic antenna for determining the frequency at the site. 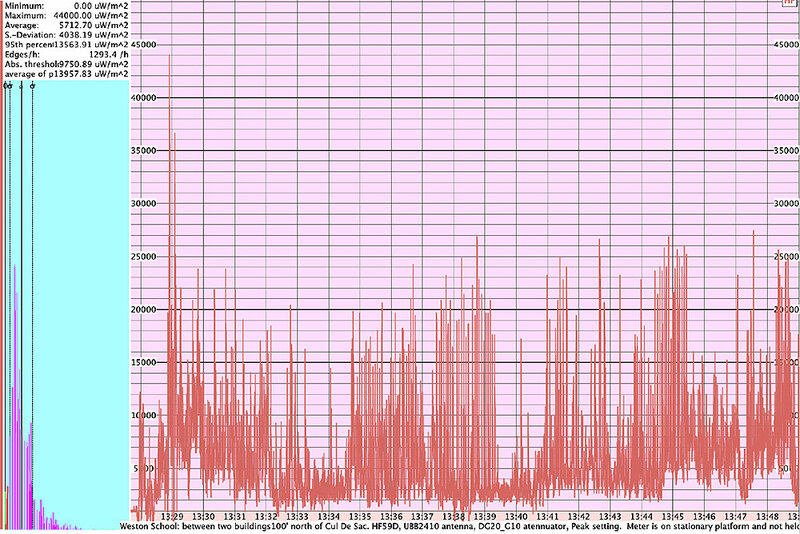 It clearly shows the dominant frequency was 3.544 GHz, said Windheim, adding that it is the frequency common to WiMAX. That may be incorrect, according to Behr. “There has been no WiMAX in the Sprint system for years and was never used for a 30-mile range,” he said. According to FierceWireless, Sprint shut down its WiMAX network on Nov. 6, 2015. In addition to becoming a Building Biology Ecology Consultant (BBEC) in 2015, Windheim received certification as an Electromagnetic Radiation Specialist (EMRS) the same year. His EMRS status is frequently identified in the press providing a level of credibility, but it is not generally recognized in the professional RFR community, according to two RF subject matter experts contacted by Wireless Estimator. Behr, who was a director and officer of iNARTE, a certifying organization for engineers and technicians in the fields of telecommunications, electromagnetic compatibility/interference and a number of other fields, said that there is no recognized mechanism for certifying expertise in the RF safety area. The trademarked EMRS certification is provided by the International Institute for Building-Biology & Ecology of which there are 27 certificate holders, nine from California. Founded in 1934, it wasn’t until 69 years later that the FCC issued its first citation for exceeding RF exposure limits against FM radio station KTMN in New Mexico, fining the broadcaster $10,000 in 2003. The Commission said the station exceeded the limits for the general public by more than 300% of the maximum permissible exposure (MPE). In another first that year, the agency fined four broadcasters a total of $40,000 for jointly exceeding MPE limits by 60.5% from their Mt. Wilson tower in Los Angeles, Calif. Since then, approximately five other broadcasters have been cited for MPE violations adopted by the FCC in 1996. In 2015, T-Mobile and Sprint were fined when their antennas on the same Phoenix, Ariz. rooftop exceeded MPE limits for the general population with T-Mobile at 298% and Sprint at 198%. Carriers were cautioned and cited for not properly marking rooftop site locations over the years. The Wall Street Journal in 2014 raised concerns when it stated that one in 10 antenna sites does not adhere to FCC guidelines for providing the appropriate level of awareness and control to workers who may be exposed to RF radiation above the limits for the general population. However, a search of the FCC’s Notice of Apparent Liability documents could not find any cell site that was properly marked that exceeded MPE levels.